World Kindness Day is Nov. 13: Celebrate Workplace Kindness! | gThankYou! Yet the workplace is one place where kindness is not emphasized and often sorely missed — we’re too busy, too distracted, too competitive. The climate of communication today is often unkind, too. We’re barely a week out from a bitterly divisive presidential election with name-calling from both sides. We have been immersed in inconsiderate commentary for endless months. We all need kindness — today more than ever. In employee management in particular, kindness is powerful. It lifts up people, and it lifts up business. Sharing kindness makes both the giver and the receiver feel good. It sparks a kindness chain reaction. World Kindness Day seeks to challenge the status quo and promote everyday kindness through gratitude and action. Celebrate it this Sunday, Nov. 13! Better yet, choose to invest in your workplace culture by focusing on building a climate of kindness. We love the inspiration from the RAK Foundation and bet you will, too. Read on for examples of workplace kindness and tips for celebrating #WorldKindnessDay with your employees. Kindness attracts employees, creates an atmosphere of innovation, racks up sales from customers and can even help a company tough-out hard times. Brandon had this realization during a visit to the burger joint Five Guys. “I had ordered fries to share with my wife. We waited and waited. I noticed how the employees reacted when we finally alerted them to the problem. They didn’t turn on each other like vultures. What’s so great about this anecdote is that it shows how action-oriented kindness is. And practical! Blame is counterproductive and is ultimately irrelevant in most scenarios. These employees weren’t just kind to a customer, they were kind to each other. Kindness can be an act or the articulation of gratitude, but it’s also a shift in mindset. And it defines your whole company culture. “You can only create one culture. Either everyone has an attitude of accusation or they have an attitude of encouragement. You have to pick the one that works,” Brandon writes. The culture that works is one of kindness and encouragement. World Kindness Day is a “global 24-hour celebration dedicated to paying it forward and focusing on the good,” according to the Random Acts of Kindness (RAK) Foundation. The RAK Foundation website is a good place to start for resources, logos and ideas for celebrating World Kindness Day (and Random Acts of Kindness Day, which is coming up Friday, Feb. 17, 2017). The nonprofit organization also has social media accounts with inspiring content on Facebook, Twitter, Instagram and Pinterest. Chime in on social media with the hashtag #WorldKindnessDay! Put on matching company shirts and take your team out to a local shopping mall or other heavily trafficked area to hand out treats to passersby. It doesn’t matter exactly what you’re handing out — cookies, cake, lollipops, $5 gift certificates, fresh fruit, dog treats. What matters is that everyone is having fun and making positive connections through kindness. If someone on your team has a chronically ill child or parent, or has recently gone through trauma like a serious car accident, get together to do something nice for that person or their family. It could be as simple as a “Thinking of You” card or sending flowers to their home. Practicing kindness doesn’t always come naturally, especially for business leaders who are caught up in worry, competition or crisis management. Help them see a new perspective: encourage and offer coaching in how to build workplace kindness. After all, for kindness to have lasting impact in the workplace, it needs to start from the top. Looking for more inspiration? Browse through dozens of kindness ideas from RAK Foundation members. Not all are workplace-related, but many can be adapted as workplace kindness activities. And of course the simplest way to participate in World Kindness Day is to be kind to someone. Hold a door. Give a compliment. Ask and listen. Pay for someone’s coffee. Smile at a stranger. You’ll be sparking a kindness chain reaction. May World Kindness Day bring you and your team joy! 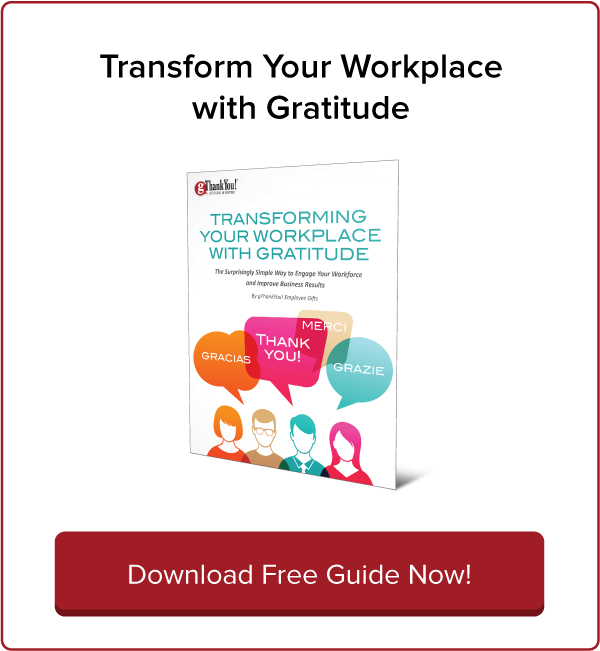 Download gThankYou’s must-have free eBook, “Transform Your Workplace With Gratitude” and start building a culture of gratitude in your workplace today! This valuable resource is full of practical learning that you can start putting to use immediately. Learn from positive psychology and leadership experts how to build (and sustain!) 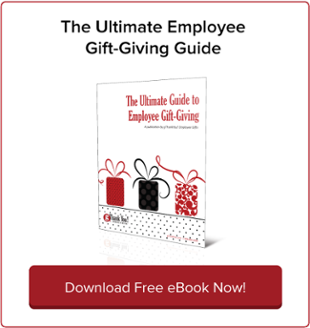 a workplace culture of gratitude that attracts employees and customers. 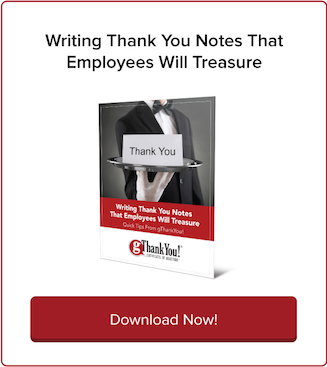 gThankYou, LLC provides company leaders with a variety of easy, meaningful and affordable ways to recognize and reward employees, holiday time or anytime. gThankYou! Certificates of Gratitude and our free “Thank You” Enclosure Cards are easily customized to incorporate your company logo. And nearly all orders ship the same day. 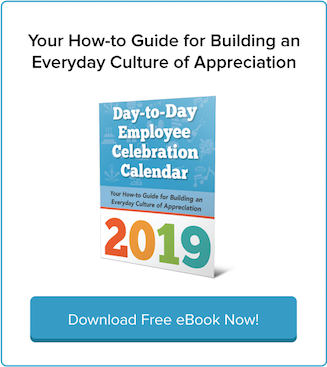 Celebrate World Gratitude Day With Your Employees!